Twitter’s minimalist sign-up flow seems to be coming back to bite it. All it asks is for a name, username, and email or phone number. That made it super quick to register an account, which is helpful on mobile. But without gender, age, and other demographic info, it’s difficult to accurately target its ads to the people businesses want to reach. 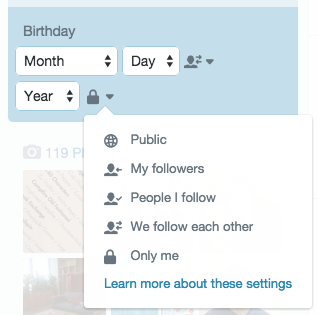 You’ll soon be able to go to Twitter.com and edit your profile to add your birthdate. You can select whether to make the whole thing visible to others, or only the month and day if you’re a little shy about exactly how many times you’ve revolved around the sun. I’d bet Twitter might alert the people you interact with most about your birthday so they can send you #HBD tweets. Way back in 2010, Facebook made one of its smartest moves ever by pushing people’s biographical information to the top of their profile where everyone would see it. This strongly encouraged users to fill theirs in, keep it current, and remind friends if their data was missing or out of date. That fueled the rapid ascent of its ad targeting engine and its ongoing financial success. Now Twitter is trying to play catch up. It’s recently gotten much more serious about ads. Just this morning it launched a mobile ad manager. You can’t fault it for trying to get more data. Well, I guess you could because date of birth is often used in security questions. Personally, though, I’d rather see ads meant for people my age than teens or senior citizens. Still, this approach feels a little smarmy. Offering more social utility rather than a token design flourish would make me more comfortable volunteering my information. In that sense, it asking for more data, like hometown, education history, or my other social accounts, might have been better. At least then it could help other people figure out if they know me or want to follow me, instead of me just filling Twitter’s data vault in exchange for colored pixels.